Bipolar research – working together to decide which outcomes matter. When researchers are developing a study that involves a trial in order to compare treatment A to treatment B, they need to decide on what outcomes to measure. Often this is through a series of questionnaires with research participants and sometimes through tests like measuring weight, blood tests or saliva samples. Lots of research is carried out but few studies can compare results because they measure different outcomes. We are involved in research trying to change that. On 27th September 2017, the PARTNERS2 research team hosted a consensus meeting at the University of Birmingham to finalise a core outcome set for bipolar. A core outcome set is ‘a standardised set of outcomes that represent the minimum that should be measured and reported in all clinical trials for a specific topic area’. In this case, for all community-based bipolar research trials. We hope that this will make future trials easier to compare, so our knowledge about bipolar can increase, and as a result, improve services and the lives of people with bipolar. The PARTNERS2 research team have been working on the core outcome set for bipolar over the last 2-3 years. 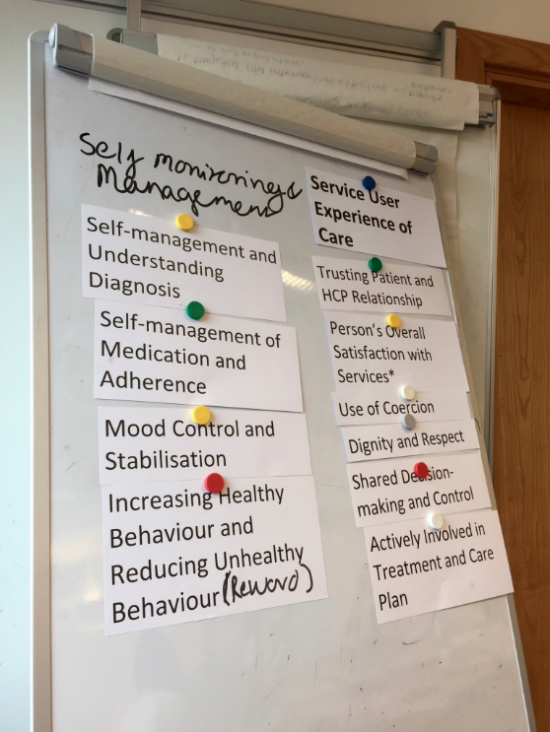 Firstly identifying a long list of potential outcomes to be included in the set through a review of existing measures and qualitative research with a range of stakeholders including service users, carers, health care professionals and researchers. Secondly, the long list was refined by the PARTNERS2 lived experience advisory panels and study staff. 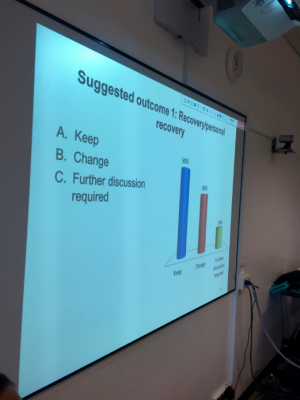 Thirdly, the outcomes were used to inform an online two-round Delphi survey – where stakeholders were invited to rate the importance of each outcome listed. The Consensus meeting was the final step in the process and therefore the stakes were high! The key point about this whole process is the idea that you can build a consensus over what outcomes to measure in all community based bipolar research trials working with experts on bipolar – clinicians, service users, carers and researchers. A diversity of perspective was important as well as an understanding of the task at hand. Most people attending had taken part in the Delphi process already, but there were extra people not familiar with our work to date. 14 people attended, with 7 experts from experience, and 7 practitioners ranging from psychiatrists to researchers working on bipolar studies. The process has been tricky! It started with over 70 possible outcomes and after the Delphi survey, there were still 50 on the list where less than 70% of stakeholders agreed each item was important. This is too many outcomes to routinely collect in a trial. The team, therefore, clustered the 50 items and took these to the consensus meeting to be discussed. Participants voted on each proposal using anonymous voting software. Opinions varied including within groups such as service users and practitioners. After long discussions and sometimes several rounds of voting, the group reached a consensus of 11 outcomes for the bipolar core outcome set. The meeting was chaired by Mel Calvert, Professor of Outcomes Methodology at the University of Birmingham, and John Gibson, Service User Researcher for PARTNERS2. Mel specialises in researching outcomes, whilst John has a diagnosis of bipolar and works for the McPin Foundation and North Staffs Mind. The combination of expertise involved in this process is a real strength. Hopefully, mental health research studies can be improved as a result of a core outcome set, which will help guide researchers in their measurement choices. Thank you so much to all who have participated in this study. If you would like to participate in mental health research please sign up to our involvement bulletin.